Tuesday nights beginning May 12th! Week #1 proved to be a tough bite for most teams with post cold front conditions. Eric and Adam Spray took top honors weighing in 2 fish for 6 lbs 10 oz and also had the big fish of the night, a 4 lb 1 oz walleye. In second place was Rick and Brennen Longnecker, who weighed 3 fish for 5 lbs 8 oz. Pete McGinty and Dave Fernholz (subbing for Dallas Croatt), weighed in 1 fish for 2 lbs 14 oz to take third place. Week #2 was another tough bite. Teams were faced again with post cold front conditions and very dirty water conditions. Only 3 fish were brought to the scale. There was a tie for first place between Corey/Jerry Heinrich and Rick/Brennen Longnecker. 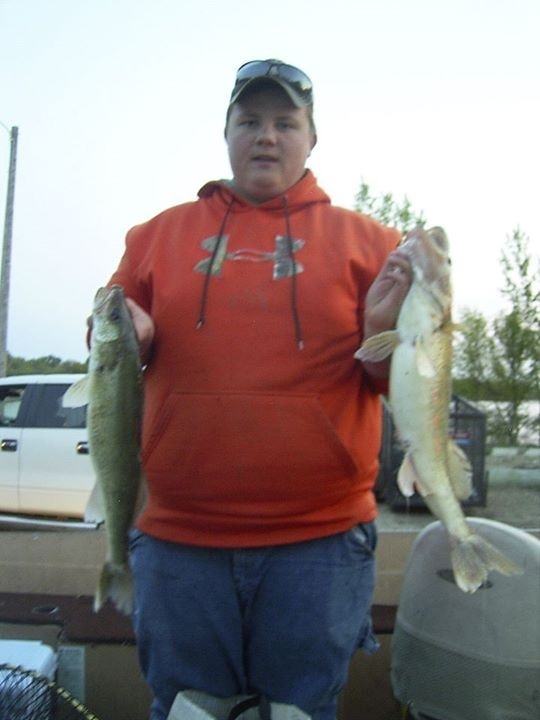 Heinrichs weighed 1 fish for 9 lbs 14 oz and Longneckers weighed 2 fish for 9 lbs 14 oz. Corey and Jerry Heinrich took big fish honors for the night. Week #3 was a great night of fishing! 55 walleyes were brought to the scale weighing 137 lbs 13 oz, for an average of 2.5 lbs per fish. First place went to Brent Zupan and Tom Ludvigson who weighed 5 fish for 15 lbs 14 oz. Second place went to Rick and Brennen Longnecker who weighed 5 fish for 14 lbs. Third place was Josh Weckwerth and Dustin Stone who weighed 4 fish for 13 lbs 13 oz and they also had the big fish of the night which was a 6 lber. Rounding out the top 4 was Jeri Ruth and Kelvin Weber who weighed 5 fish for 13 lbs 7 oz. Week #4 was a pretty good night of fishing, a little slower than the last. 38 walleyes were weighed in for 83 lbs 3 oz, for an average of 2.2 lbs per fish. First place went to Jeri Ruth and Kelvin Weber who weighed a 5 fish basket for 14 lbs 8 oz, which also included the big fish, a 4.7 pounder. Second place went to Corey Joyce and Paul Larson, who weighed 5 fish for 12 lbs 1 oz. Third place went to Eric and Adam Spray, who weighed 5 fish for 9 lbs 1 oz. Rounding out the top 4 was Pete McGinty and Todd Stensrud (subbing for Dallas Croatt), with 4 fish weighing, 8 lbs 8 oz. Week #5 was a tough bite for most of the field. There were only 14 fish caught for 39 lbs 3 oz, or an average of 2 lb 13 oz per fish. First place went to Steve Dahle and Jamie Jahn who weighed 2 fish for 9 lbs 14 oz. The also had the big fish of the night a 7 lb ll oz walleye. Second place was Kelvin Weber and Jeri Ruth with 2 fish for 6 lbs 2 oz. Third place was Pete McGinty and Dallas Croatt with 2 fish weighing 4 lbs 14 oz. Fourth place went to J.P Pringle and Todd Olson who weighed 1 fish for 4 lbs 13 oz. Week #6 was another tough bite. Only 13 fish were brought to the scales for a total weight of 27 lbs, or an average of 2 lb 1 oz average. First place went to Kelvin Weber and Jeri Ruth who weighed 2 fish for 5 lbs 10 oz. Second place went to Eric and Adam Spray who weighed 3 fish for 4 lbs 3 oz. Third place went to Dave Cornelius and Mike Montag who weighed 1 fish for 3 lbs 15 oz. They also had the big fish of the night. Fourth place went to Pete McGinty and Dallas Croatt who had 1 fish for 2 lbs 8 oz. Two weeks remain and it is still a pretty tight race for the 2nd and 3rd place spots. Week #7 was another tough bite for most of the field. Only 8 fish were brought to the scales for a total of 25 lbs, or an average of 3.125 lb average. First place went to Jamie Jahn and Steve Dahle who weighed 2 fish for 8 lbs 5 oz. 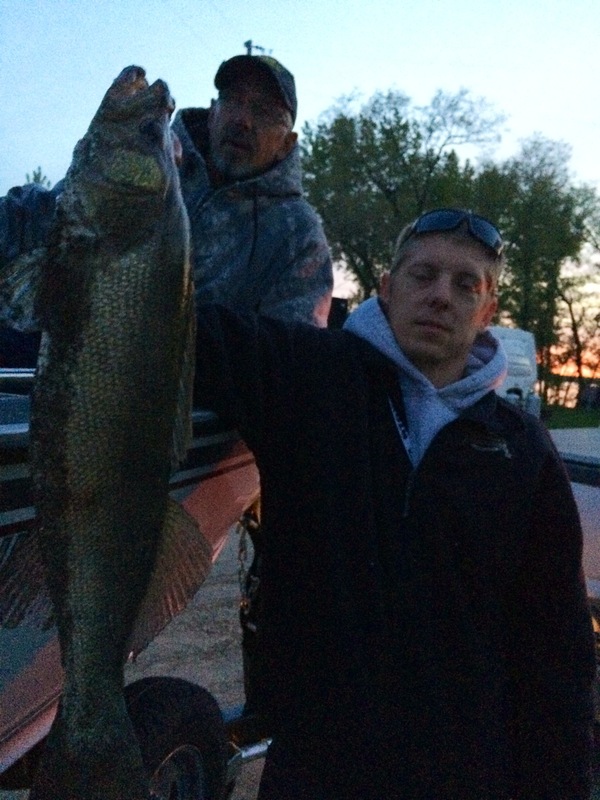 They also cashed in on the big fish of the night, a 6 lb 11 oz walleye. Second place went to Jon Jerve and Tony Omacht who weighed 1 fish for 5 lbs 10 oz. Third place went to Cody Enger and Sean Hauck who weighed 2 fish for 4 lbs 9 oz. Fourth place went to Brent Zupan and Tom Ludvigson who had 1 fish for 2 lbs 11 oz. Next week is the last week of league and it is still a tight race for the top 3 spots. Week #8 saw 10 fish brought to the scales for a total of 30 lbs 6 ounces, or a 3 pound average. First place went to Corey and Jerry Heinrich who weighed 2 fish for 8 lbs 10 ounces, including the big fish of the night a 5 + pounder. Second place went to Pete McGinty and Dave Fernholz (subbing for Dallas Croatt), they weighed 2 fish for 6 lbs 3 oz. Third place was Jeri Ruth and Kelvin Weber who weighed 2 fish for 6 lbs. Fourth place went to Jack Anderson and Corey Reifenberger who had 2 fish for 5 lbs 8 oz. Final 2015 Fishing League Standings are updated and can viewed using the link at the bottom of the page. Left to Right: Kelvin Weber, Jeri Ruth, Pete McGinty, Rick Longnecker, Brennan Longnecker. Not pictured Dallas Croatt.